Recently, four things have been brought to my notice and all refer to the same place. We are grateful to all who have provided the two maps, a photograph and information. The area concerned is Woodcock Lane which borders Spencers Wood and Three Mile Cross, runs alongside the Swallowfield Bypass and reaches the Devils Highway at Beech Hill to go onto Silchester. A major route in times past. Firstly, I was given a map by a friend who worked for the Thames Valley buses showing the area in 1936 and before the M4 was built. It showed two commons namely, Whitley Wood Common and Lea Common which were both cut in half in 1971 by the M4. The Swallowfield Bypass which was approved in 1963 went from Lea Common to Riseley protecting Three Mile Cross, Spencers Wood and Swallowfield from excessive traffic. It also divided Shinfield Parish cutting off Grazeley Road where the new development in Three Mile Cross has recently been built. 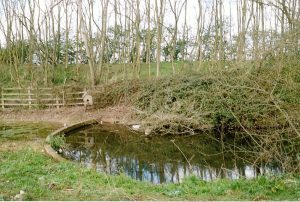 It was at this point, so Ian Clarke of the Council informed me, that the developers had cleared out the pond and it was remarkable in that it was a circular brick built pond with an overflow making it tear shaped. It is worth looking at. 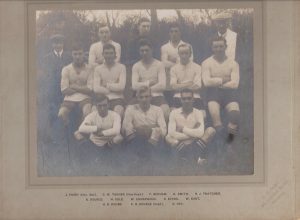 There are pictures of it on our website (www.swlhg.co.uk). Great Lea Farm which lies the other side of the Bypass close to the caravan site, in Grazeley. The picture shows Grazeley Road behind the farm and Woodcock Lane in front. 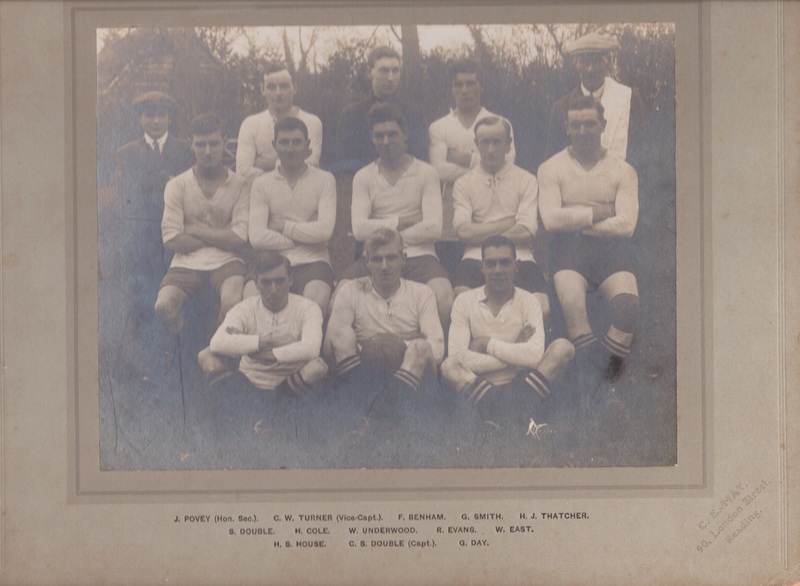 Bob discovered the picture when clearing out his late uncle’s house and had it copied and enlarged for us. 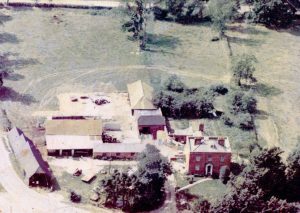 The property was once owned by the Body family who owned many other properties in the area including Hyde End Farm and Manor Farm on Basingstoke Road in Reading. 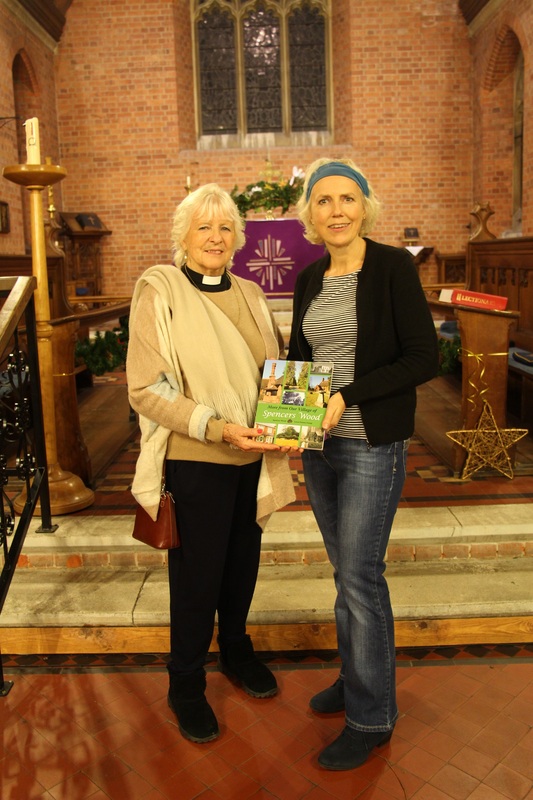 One of the family was implicit in the building of Three Mile Cross Chapel at the end of Grazeley Road and a copy of our history book about the Chapel, called A History of Three Mile Cross Methodist Church, can be found in the Swan Public house. 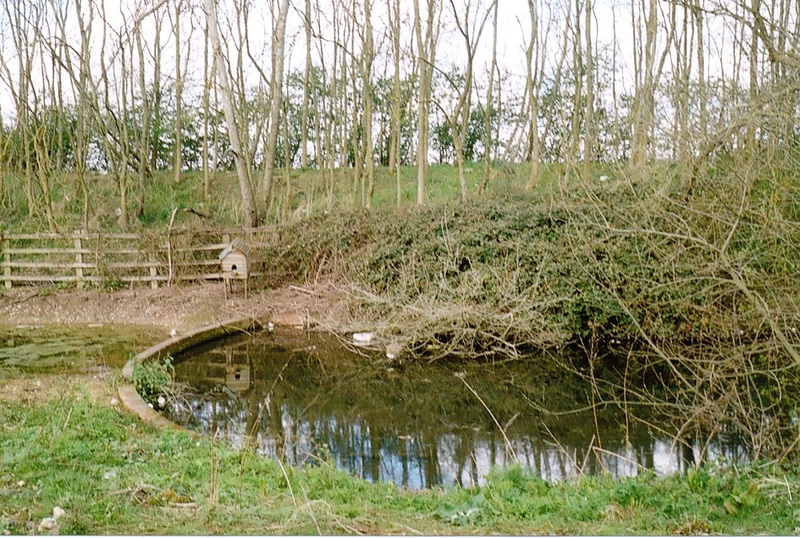 The house was demolished though to build the Bypass which thunders past the pond today. 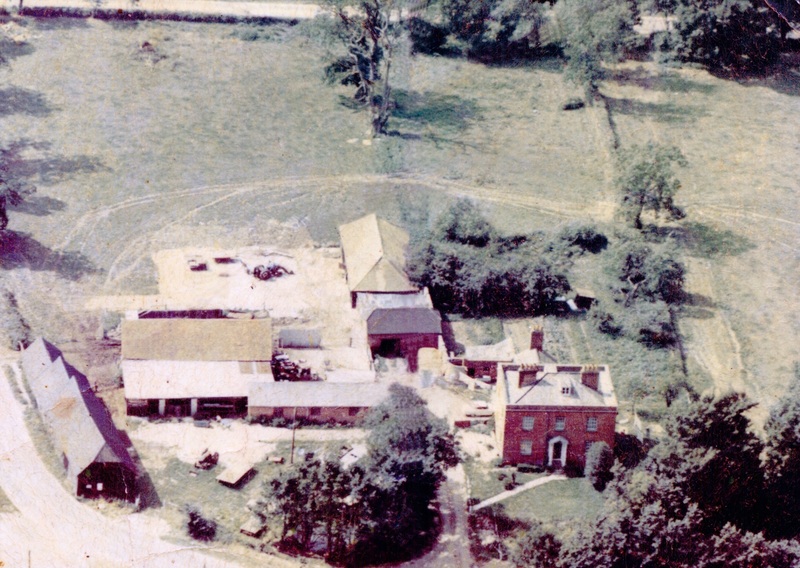 The final item I was given was another map from the 19th century showing that the house was called Woodcock Lane Farm. This map is detailed to show the layout of the farm buildings and it confirms the picture is the same farm. 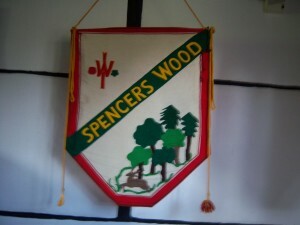 It also shows that Woodcock Lane is the drive to the farm with an avenue of trees lining it and how the lane got its’ name. Woodcock Lane is also well worth a visit. 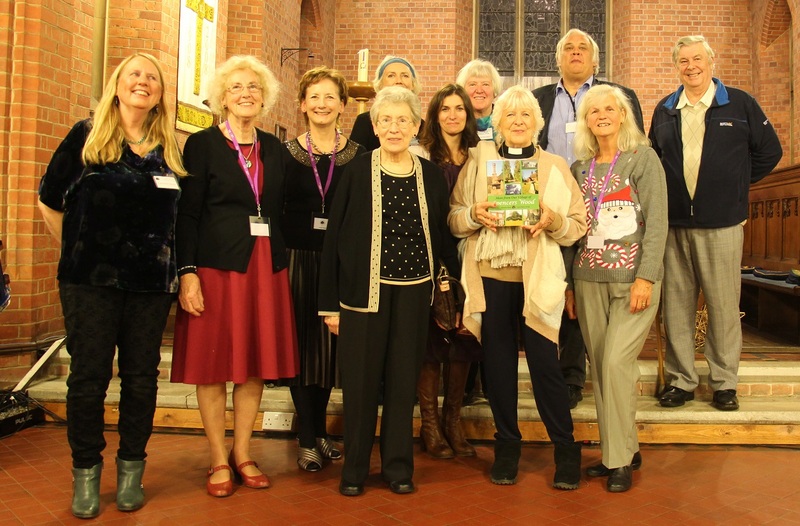 7 December saw the launch of our new book, More from Our Village of Spencers Wood, in St Michael’s Church. Wine and nibbles were served, including cheese provided by Village Maid Dairies. Mary Wheway got the proceedings off to a flying start by introducing the group and then Prof. Richard Hoyle gave a short talk on the village and the writing of its story, emphasising that though no king or queen has ever slept in Spencers Wood, it still has an interesting history. The book traces the making of the Spencers Wood we know: it tells the history of the ordinary people who have lived here and shaped the village. 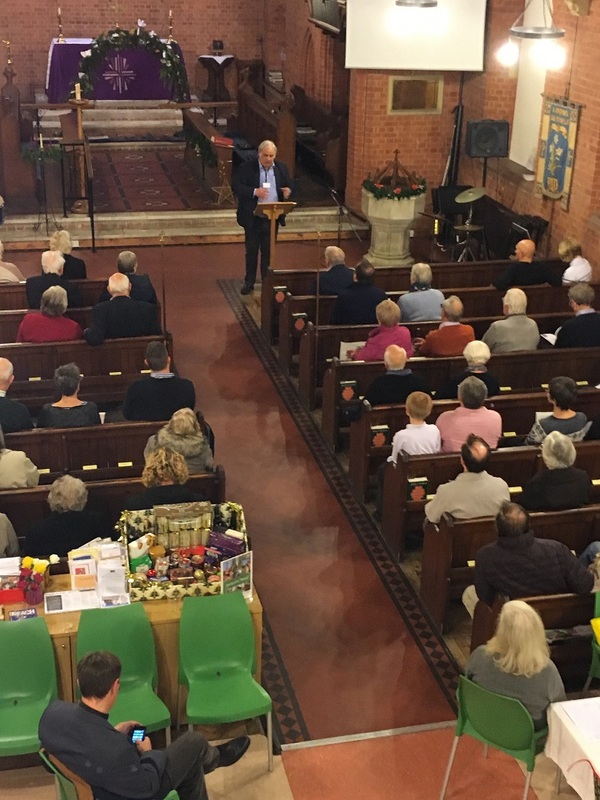 Richard reminded the audience that the writing of history is never done and requested anyone who has any documents, photos etc that relate to the history of the village to get in touch with us (spwood.localhistory@googlemail.com). Jeannie Brice then presented our guest, Rev. Marion Pyke, with the first copy of the book and Marion said a few words about growing up in the village, and how strong her ties have been with it. As readers of the book will know, the blacksmith’s smithy features largely in Marion’s memories of her childhood, and after the presentation, Marion fell into conversation with the blacksmith’s son, Mr Doug Double, and they discovered to their mutual delight that they had both been born in the same house, Westview. Doug Double & Marion Pyke introducing themselves! 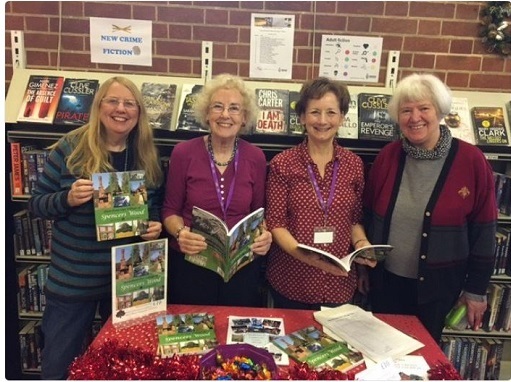 The evening provided a splendid occasion for launching the book, with events held on the following two days in the Library and the Village Hall and a stall at St Michael’s Fayre on the Saturday. Further events are being planned and the book is on sale in the Post Office, or can be obtained from members of the group, price £13. 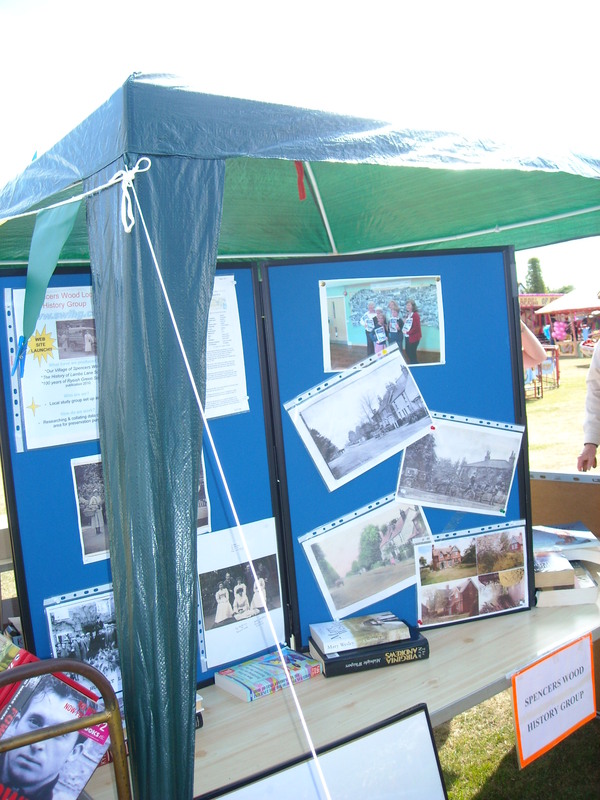 All Members of Spencers Wood Local History Group, Contributors (Sarah Codling & Richard Hoyle), and Marion Pyke. 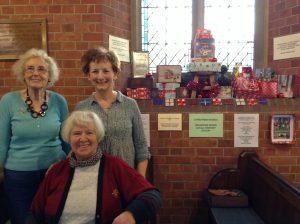 The group was also busy in December decorating one of the church windows on the theme of Christmas Boxes. 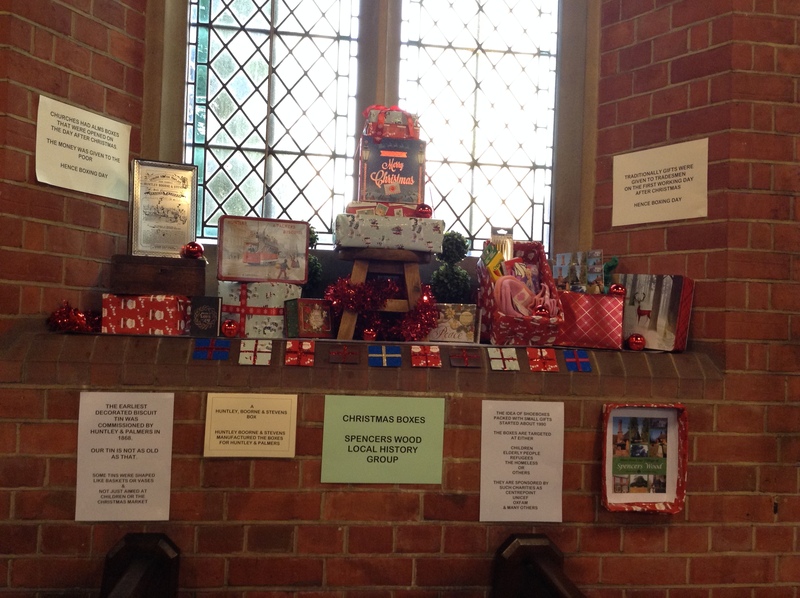 The display included an old wooden box to represent the tradition of presenting servants or tradesmen with ‘Christmas boxes’ containing money or presents on ‘Boxing Day’; a tin box bearing the name Huntley, Boorne and Stevens, which would have contained biscuits made by the Reading company Huntley and Palmer’s; a decorated shoe box, a modern-day idea, containing small and useful items which are donated to various charities to help people in need; and our fourth and final box contained a copy of our new book! 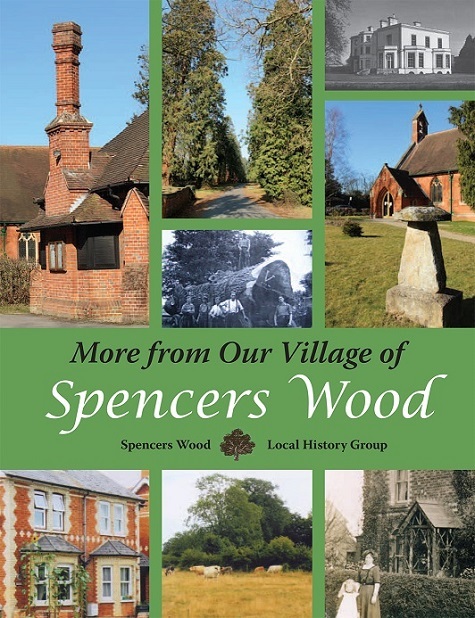 If you still want to get hold of a copy of the “More of the Village” book, they can be found at Spencers Wood Post Office, Three Mile Cross Budgens (within the petrol station) and Henry St. Garden Centre. 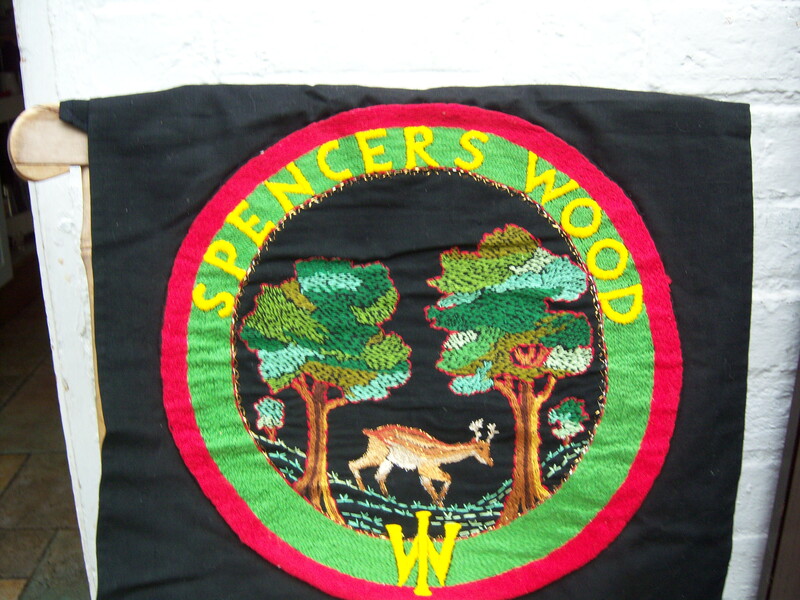 Lorna Merry was a founder member of Spencers Wood Women ‘s Institute who gave the group these memories to go in our first village book. 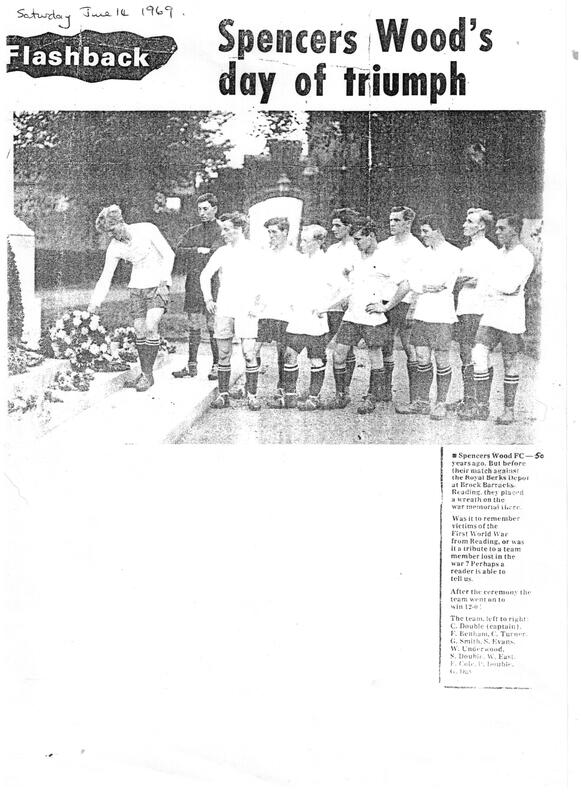 Initially there were only twenty members but the numbers increased to around sixty or so. They had lots of speakers from all walks of life and many different topics such as the police, lace making, cake decorating, painting on china, lawyers, dolls of all ages and countries, the Royal National Institute for the Blind, antiques, flower arranging etc. They had some very happy times. A choir was formed which many of them joined under the leadership of Mrs Wellstead. Practices were held at the United Reform Church in the village. 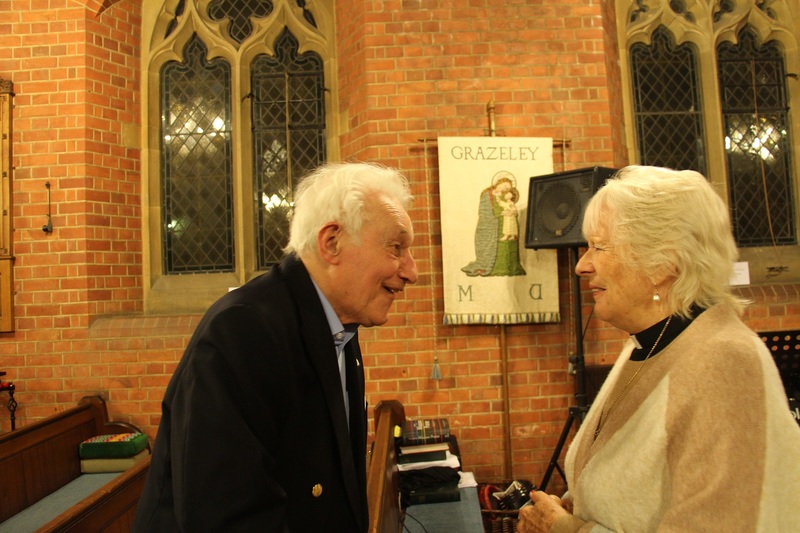 In later years, Mr Jones, who was the organist at St Michael’s church, became the conductor. Other members were Olive Franklin, Nancy Benham, Peggy Gillings, W Runyard, Lorna and many more. They also had a concert party which was great fun. On one occasion they gave a performance as ‘The Black and White Minstrels’ (a popular TV programme , which would be non politically correct today). Supper parties were held and they had many coach trips on which everyone was eager to go. The men folk often came on the trips and they enjoyed them too. On another occasion of the 21st birthday party, the branch held a dinner and social evening. A cartoonist called AREFF printed the cartoon of the committee in the local paper. These are the names in the cartoon; Joan Parkes, Edith Burningham, Peggy Gillings, Miranda Mayne, Eileen Summersgill, Barbara Panting, Mag Dore, Phil Drake, Edna Carter, Eileen Simmons, Janet Rickson, Marjorie Lyon and Lorna Merry. It was unfortunate that it had to close down in the mid 1980’s because the members were getting older and did not like walking to and from meetings on the dark nights. Lorna and her friend Vera Bowyer were the only surviving original members when they closed. Marjorie Lyon could remember the happy meetings that were held by the WI which were usually educational or instructive. Sometimes members would bring along their personal collections to show and talk about them. When the group disbanded, each member held a memento from the group and Marjorie had a cup and saucer with WI on them. The idea was that if they group ever reformed the equipment would be in safe keeping until that day. 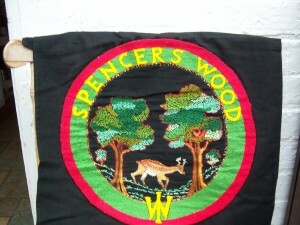 The group has been given the banner of the WI.